How can Spring 2019 advising be just two weeks away? Didn't the semester just begin? While it may feel like the Fall semester just started, we are actually well on our way to preparing for the Spring 2019 semester. Student Planning opens on Monday, Oct. 29, and online registration begins Monday, Nov. 12. Due to Fall Break, you may want to begin scheduling advising appointments with your Advisees as soon as Student Planning opens on Monday, Oct. 29. Just a quick update to make certain you are comfortable with the process of granting your advisees "Permission to Register." 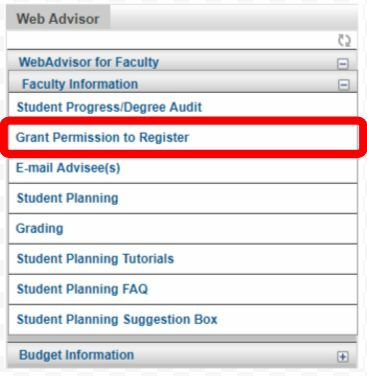 The "Grant Permission to Register" process happens at the beginning of each advising & registration period and allows the student to register for courses when the registration period opens. The Sustainable Practices Committee would like to invite faculty to participate in a series of working groups to take a deeper dive into topics raised in last year’s Campus Conversation. These tripartite working groups will help refine and implement recommendations in these areas: Waste, Grounds, Energy, Carbon Pricing, and Curricula. If you are interested in joining one of these working groups, or for more details, please reach out to Sandra Goldmark sgoldmar@barnard.edu.